January Sneak Peek #7- Graduation! January Sneak Peek #3- Capture The Magic and #4- Bon Voyage! January Sneak Peek #2- Coffee Addict! January Sneak Peek #1- Whooos Birthday! I love you to the Moon and Back! w/ Muse Jen T.
Hello Moxxie fans! We are SO excited to start sharing our new Design Team's wonderful projects with you!! We are going to have a fantastic June, busy with Moxxie fabulousness! We hope you join us daily for this awesome inspiration! Hi all, Jen t. here. 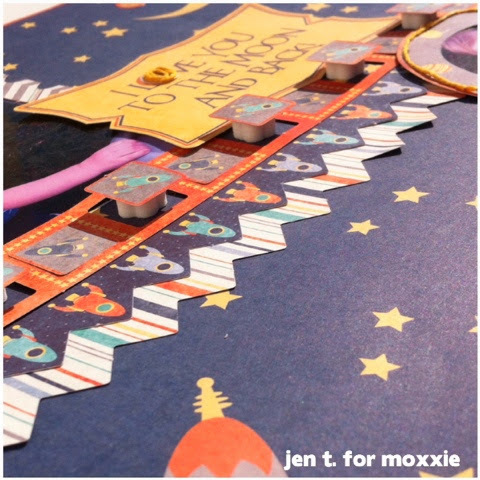 I am so excited to share my first project and blog post with you all on moxxie!! As soon as i saw this Reach for the Stars collection I just knew it would be perfect for pictures of my lil boy. I first took about a 1/4 off of each side of the rocketman paper then layered it on the orange side of the starships. Then, I layered the border diecut strips and on every other of the spaceship border I popped them out and added a popdot to each to add dimension. Next, I added the other diecuts and planet sticker. 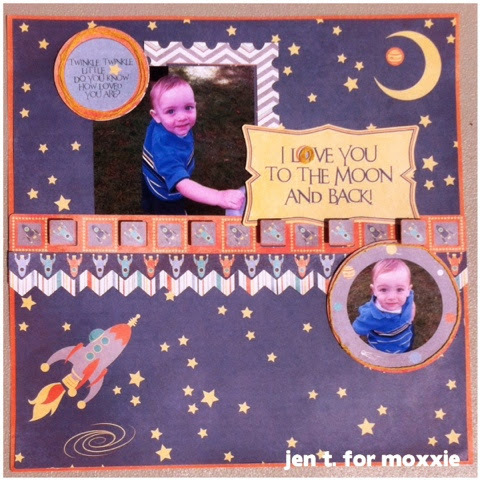 Lastly, I added orange thread from my stash onto the planet sticker and circle diecuts for texture. Hope you have a great day and happy creating! Jen t.
To get your hands on some Moxxie goodness go here.